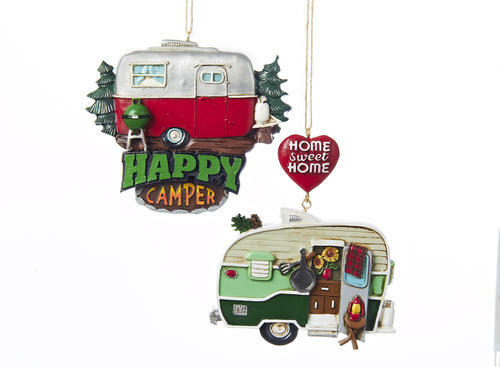 From all of us (me) here at The Small Trailer Enthusiast, may you all have a Merry Christmas, Happy Holidays, and prosperity in 2015! And no matter what faith you observe, if any, may you ALL have a year’s worth of level campsites with plenty of shade and a lakeside view! For it is the joy of camping that unites us all. 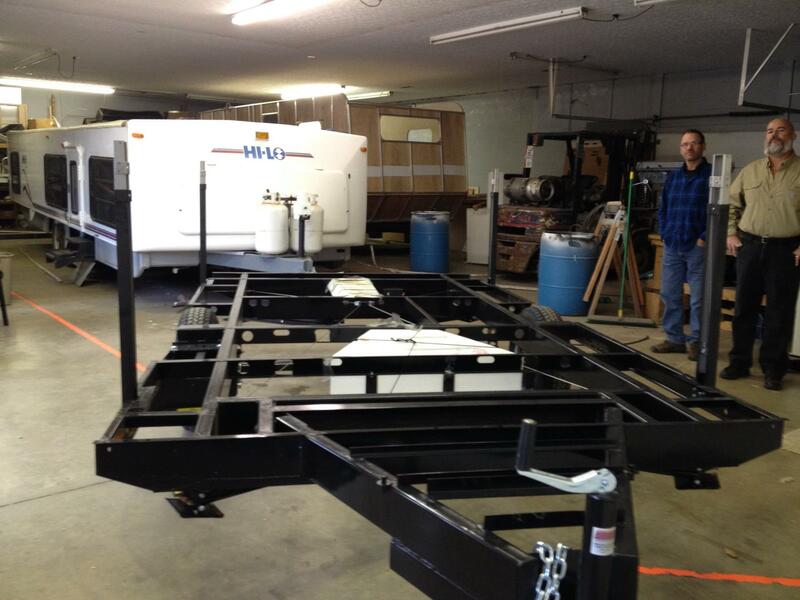 It’s been quite some time since I first announced that Hi-Lo Trailers were coming back to life. This website was just a few weeks old and it was one of the first few posts I ever made. Three years and three months ago that post was written, and the only update I had was a year later, telling you that there were essentially no updates on the Hi-Lo. While I’ve made efforts to get some facts from Hi-Lo boss and Pennsylvania RV dealer Bill Kerola, those requests have gone unanswered. 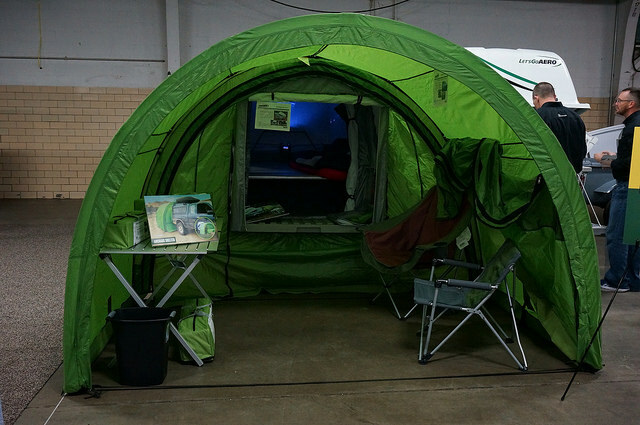 However, thanks to the Kerola Camper Store Facebook page, the first images of a Hi-Lo prototype were released. 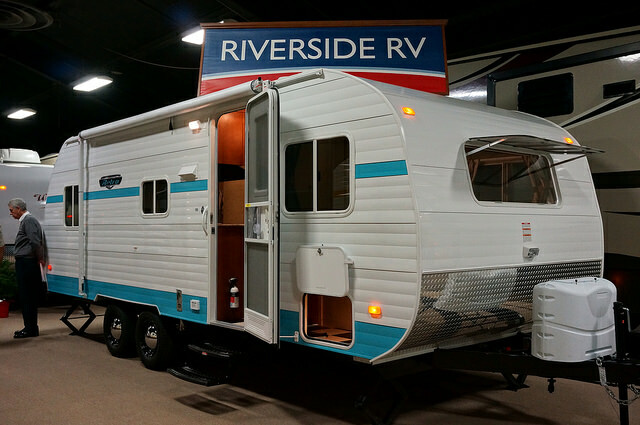 Even though I’ve not received a response from Bill Kerola, I still felt it necessary to post these pics from their Facebook page since I get e-mails periodically inquiring about the future of the Hi-Lo, and because Hi-Lo had a long run in the RV industry before shuttering their doors in 2010. This tells me it was heading somewhere outside of their Trasnfer, Pennsylvania location. 2. 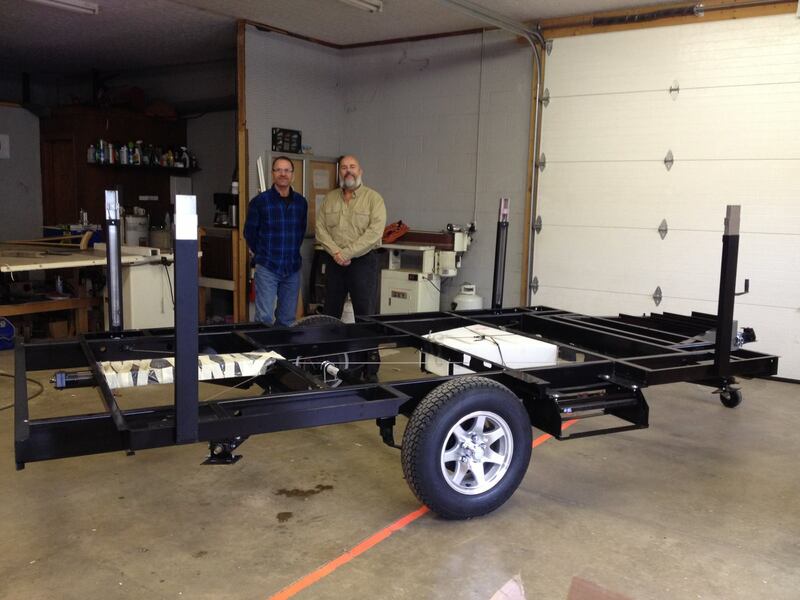 If you’ll notice in this next photo, there is a Hi-Lo pictured behind the chassis of the prototype. Since we know there are no “new” Hi-Los, that one in the background has to be a 2010 or older. “I (Joel) am the former Plant Manager of the HiLo Company and have been around HiLo for the past 30 years. That’s because my father-in-law is Jim Snyder former owner of the company. It was his brother Don Snyder who started HiLo back in 1955. 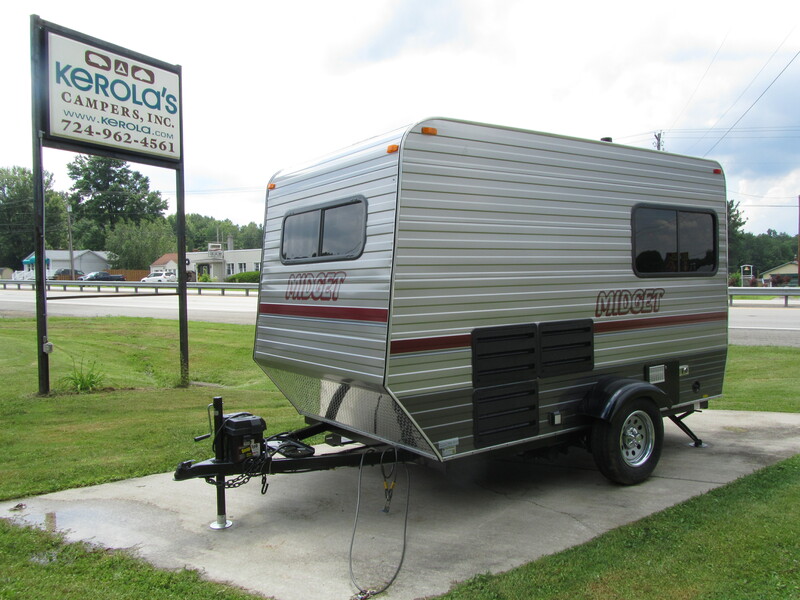 So now we see that Kerola Campers has a relationship with a trailer manufacturer who also spent time building Hi-Los and now repairing them. 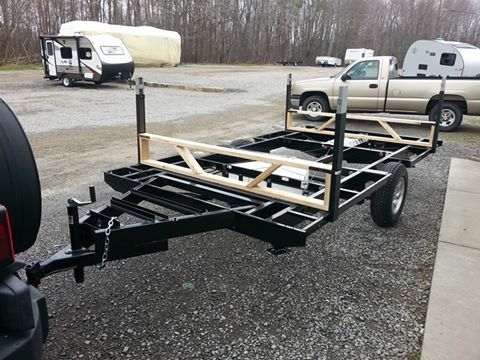 With the fact they build the Midget, this tells me they have the ability to build other trailers….perhaps even a new Hi-Lo. So when I connect all these dots, it appears to me that these former Hi-Lo employees that build trailers (The Midget) also are the ones building the new Hi-Lo. Again, just speculation, but I’d be more surprised if these aren’t the facts. Hopefully I can get a reply from Bill Kerola so he can just tell me what I think I already know. 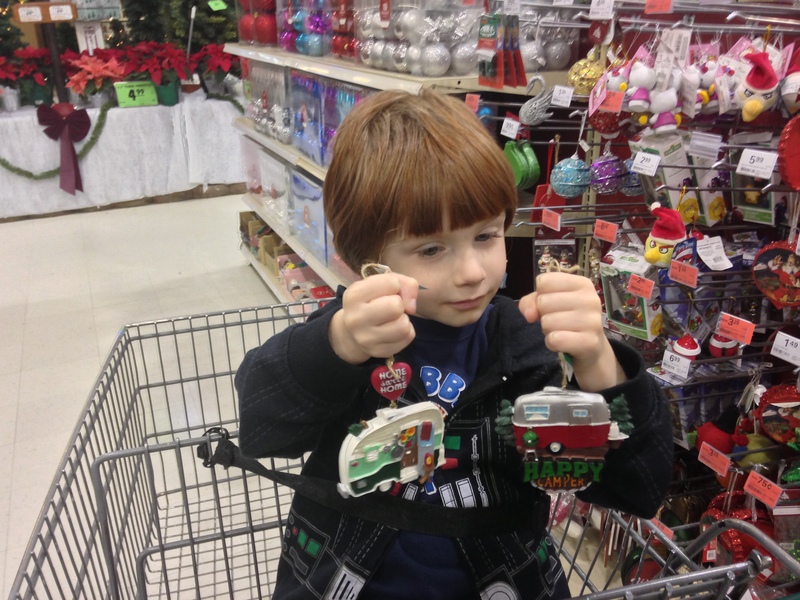 ‘Tis the season for stuffing stockings for your favorite small trailer enthusiast. Here area few I thought might go over well. First up, here’s a great way to stuff their mailbox. 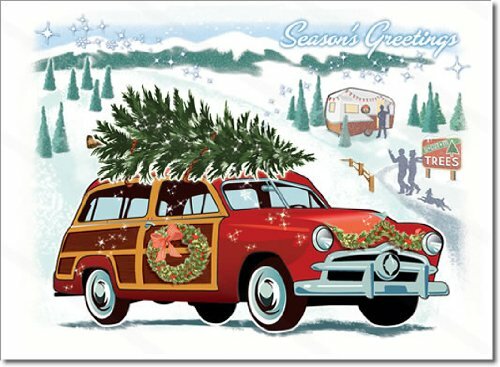 These Christmas cards from The Retro Christmas Card Company feature a classic woodie at a Christmas tree farm with a red & white Shasta Airflyte that’s used as the office. If you can’t get them through the Amazon widget, you can order them directly through their website by clicking here. I came across this diecast of a 1967 Chevy Impala with a vintage 16′ Airstream Bambi this past week at a local Meijer store. This is part of GreenLight Collectibles’ Hitch & Tow series. It’s a 1:64 scale diecast with very nice details. For those of you midwesterners where Meijer is located, you can find it in the toy department with the diecasts for around $11.00. 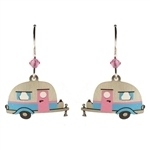 For those of you in other areas, I’ve included an Amazon widget below, or you can also try Airstream’s online shop by clicking here. 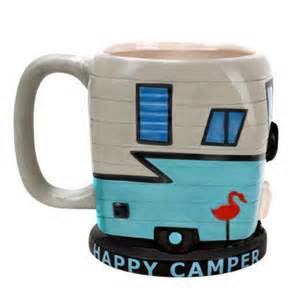 With the reissue of the 1961 Shasta Airflyte, this Happy Camper mug should go over well with new Shasta owners, as well as anyone interested in adding a little style to your cup of joe. There is a large contingent of T@B owners out there, and if they don’t already have these salt & pepper shakers, they should. 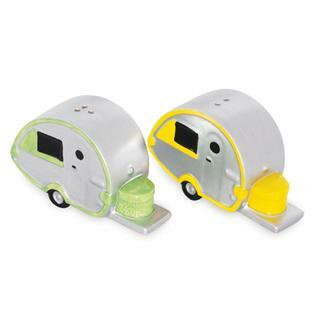 While they don’t appear to be a T@B endorsed product, it’s fairly obvious the camper from which they’re inspired. Still can’t decide what to buy? Go the easy route and buy an Amazon gift card! 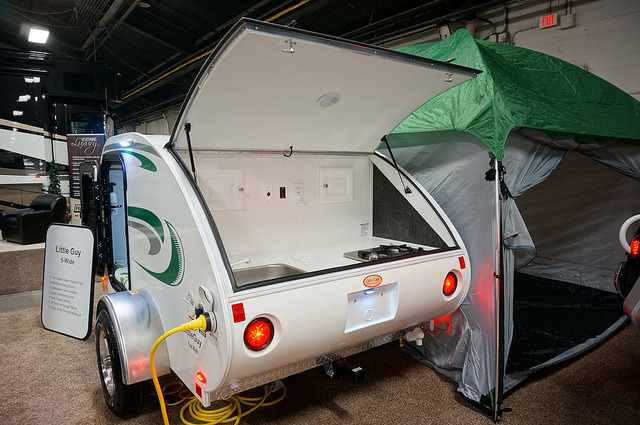 Amazon has everything under the sun RV related, and as a side benefit, any time you click on one of the Amazon links I have on this site and buy, you’re supporting The Small Trailer Enthusiast through the Amazon Associates affiliate program. 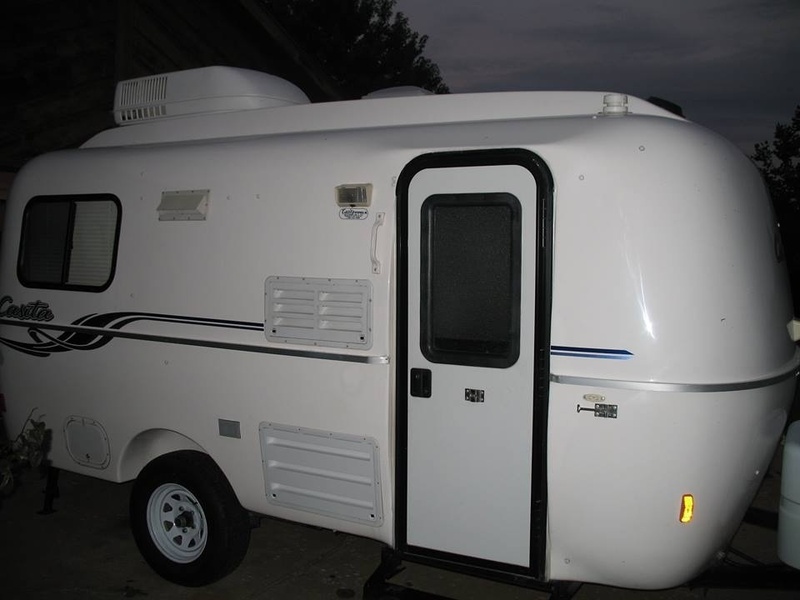 We get a percentage of the sale from Amazon and you’ve helped offset the expense of keeping YOUR favorite small trailer website on the internet. Merry Christmas! 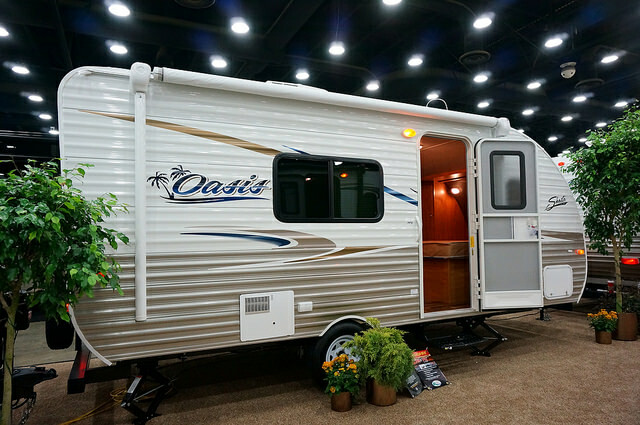 Here we go with Part 2 of the 52nd Annual RVIA trade show recap from Louisville. If you missed Part 1, click here. 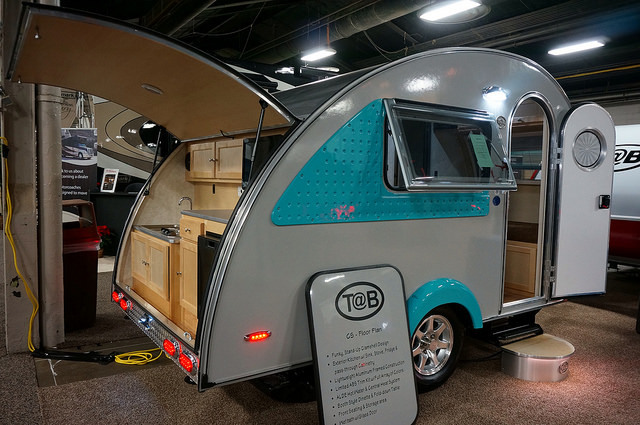 Little Guy Worldwide had a nice sampling of their product on hand this year, represented by various models of the popular T@B, T@G, myPod, and their traditional Little Guy teardrop trailer. New this year in the T@B line is the upscale Sofitel model. 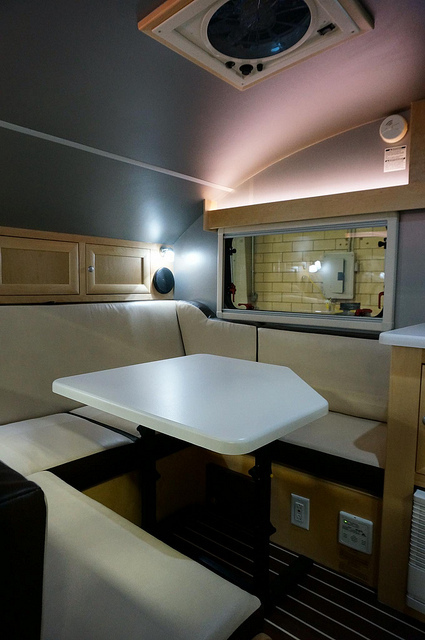 Featuring upscale cabinetry & hardware, two-tone cushions, deluxe exterior assist handle, custom alloy wheels, accent lighting, and yacht inspired flooring, the Sofitel is said to be the “Airstream of T@Bs”. 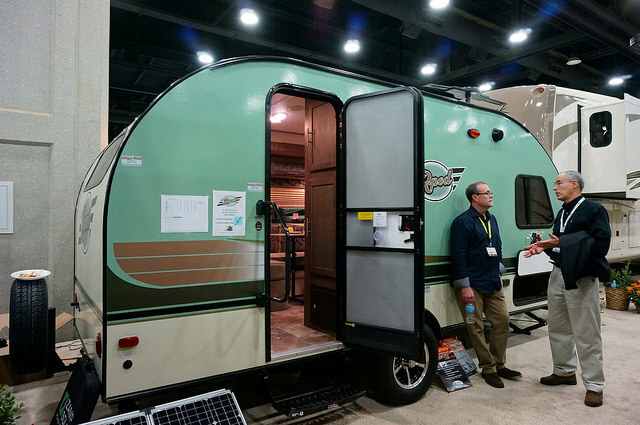 And as Chris Baum of Little Guy Worldwide told me “And it’s $25,000 less than an Airstream”. Although the MSRP for a Sofitel has been seen at $25,000, some may still balk at that price for a T@B, but loyal T@B aficionados may very well be willing to pay for such refinements. Heck, I dig it for the cool floor and wheels! 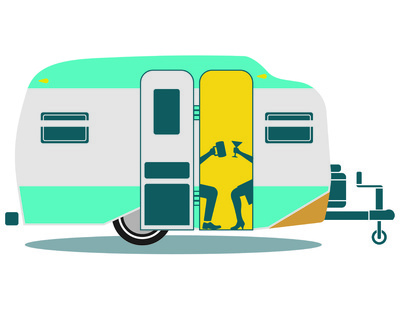 The T@B CS model continues to impress me with how well they utilize limited space. 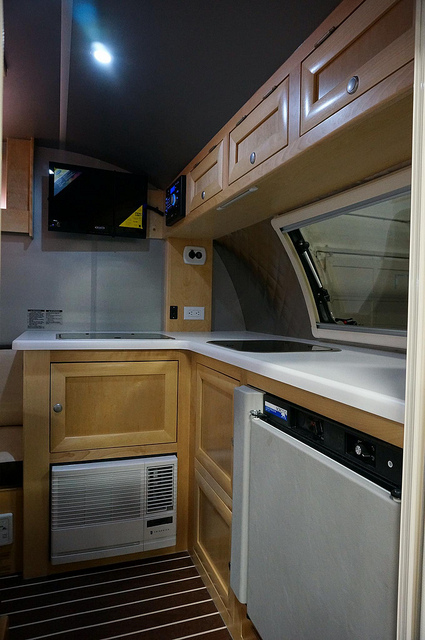 The model on display has the CS’ signature rear teardrop inspired galley with a front bench inside. This floorplan also ups the ante with the addition of a wet bath. However, despite these additions, two people could easily camp in comfort. Great job, Little Guy! 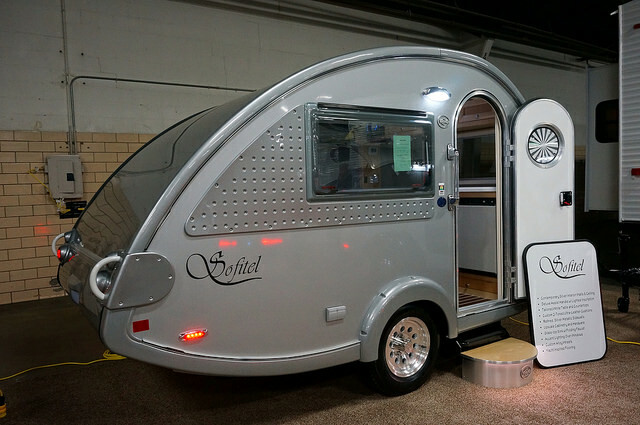 Next up was a new line by Winnebago called the Micro Minnie. 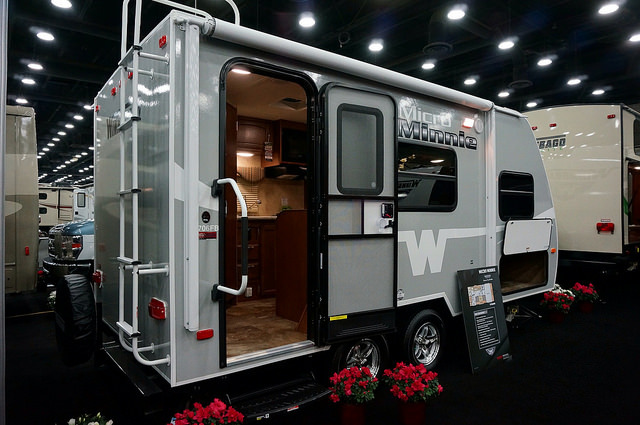 The Micro Minnie is Winnebago’s entry level trailer and only has one floor plan, which is 19’2″ long and weighs in at a dry weight of 2,980 lbs. 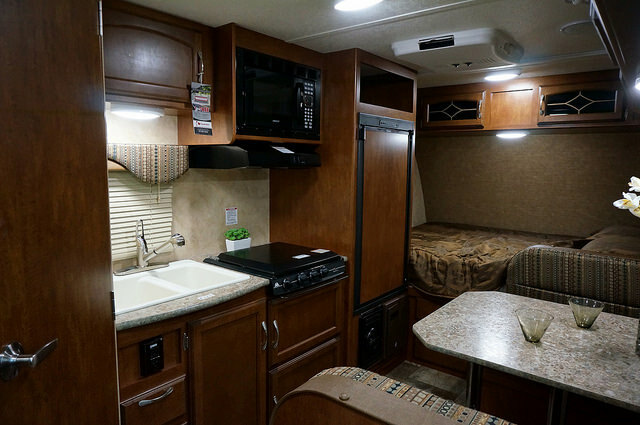 Base MSRP is under $15,000, so it’s a good option if you don’t need a lot of size, yet you still get the Winnebago quality. Palomino also had a nice selection of their Palomini line on hand. 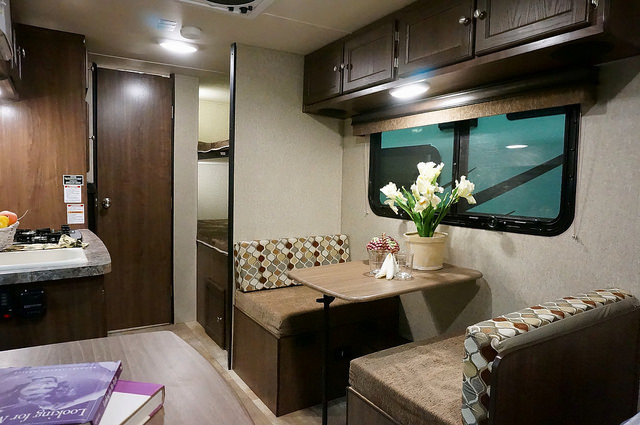 The Palomini was introduced last year and has several good floorplans, some of which include a drop floor. 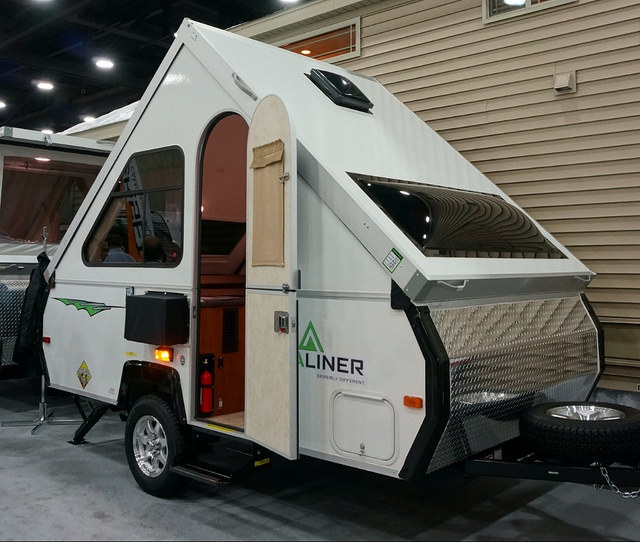 Based on the size and even appearance, the Palomini is a direct competitor to the r-pod, although they’re in the same Forest River family of RVs. 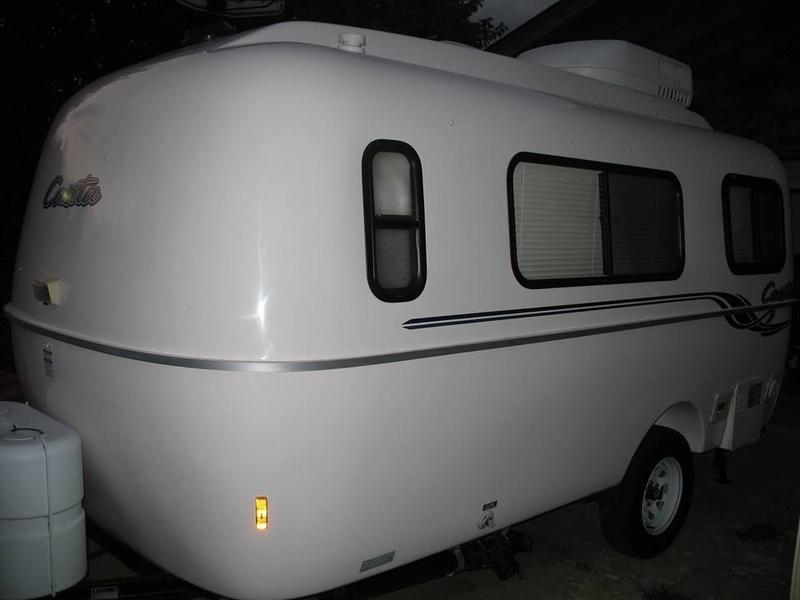 However, the Palomini can be had for much less, as some floorplans can be had for less than $10,000. I’ve had a feature on the Palomini on the backburner for a few months now, so I’ll be telling you more about them sometime this winter. There were a lot of manufacturers that were representing the hard-sided pop-up market, including Aliner, Rockwood, Flagstaff, Starcraft, and Viking. Considering it’s 1:30 am and I have to be up in 5 hours for work, I’m forgoing linking all of these manufacturers, but encourage you to check out the manufacturers page at the top of this page for links to all of them. 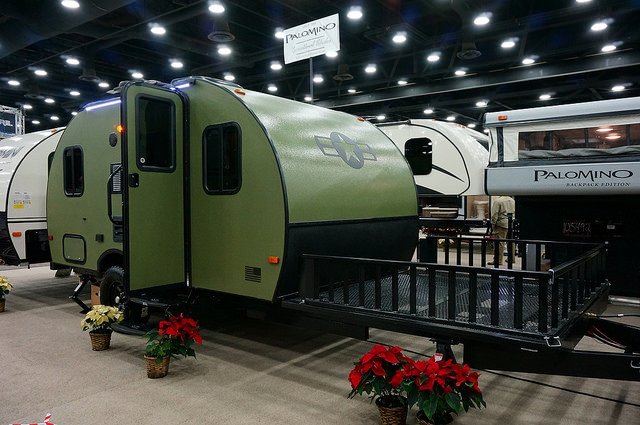 😉 If you’re a fan of these types of campers, you have plenty to choose from. One thing I’ve noticed is that many of the entry level units are becoming a little less “basic” in looks and the materials being used, which is a benefit to the consumer. 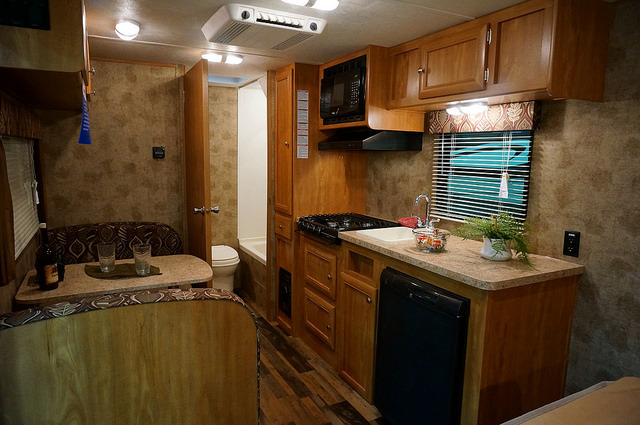 One trend that was apparent to me in many trailers, both big and small, is the move towards a wood-look flooring instead of the tile-look. Granted, all of these are generally a large one piece linoleum floor, but for my tastes it’s a refreshing trend. I wouldn’t say the wood grain look has overtaken the tile look, but it’s getting close. It should be interesting to see if that trend continues moving into 2016. 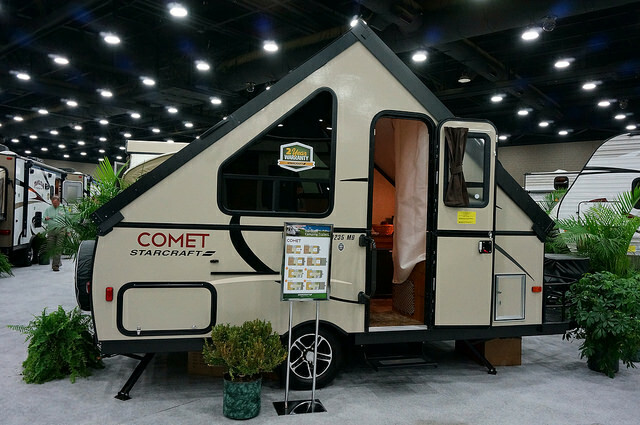 So that brings us to the close of my assessment of what’s in store for 2015 for the small trailer segment of the RV industry. 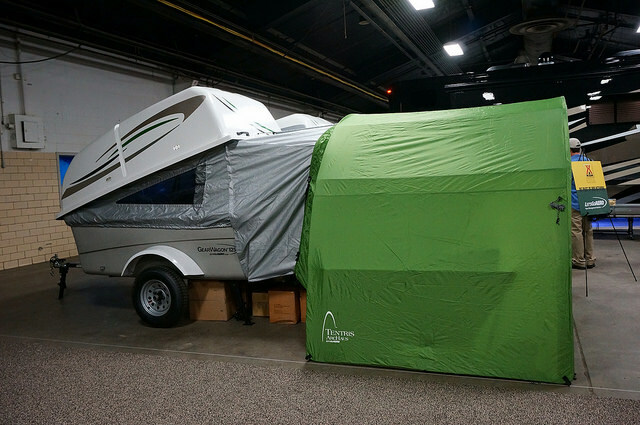 Hope you all enjoyed a sneak peek at what you have to look forward to as you look for your next trailer, or just take in an RV show in the next couple of months. 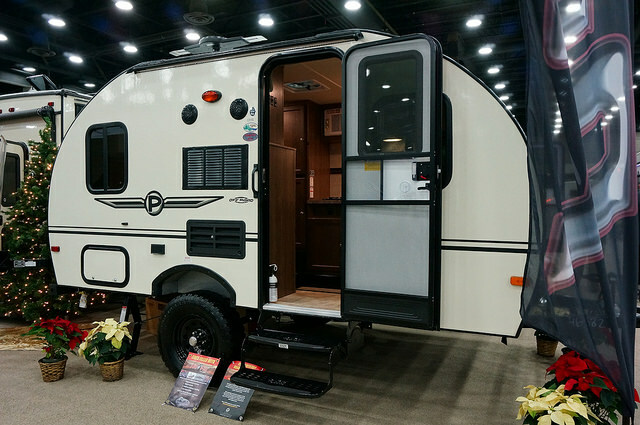 And let me take this opportunity to encourage you all to attend an RV show this winter in your area. It costs dealers a lot of dough to put these shows on and even if you don’t buy at the show or are just there to window shop, your attendance is greatly appreciated by them. Until next time, happy winter camping! If you spot it, call local authorities immediately. There are no identifying marks on it, with the exception that it did not have a spare tire cover. Please share and help Bob get his Casita back home! This was my fourth straight RVIA trade show in Louisville this past week. According to RV Pro, overall attendance was down 3%, but an interesting stat I found was that editorial press jumped an impressive 43%. Yeah us! Overall the amount of small trailers at the show was about the same. Forest River only brought one r-pod from what I could find. It was the RP-179 model with the rear kitchen which debuted last year. I do like the new paint scheme for 2015. I was somewhat surprised only one unit was there, considering they had a copy of a spreadsheet tacked to the side of it that listed sales figures for several trailers specifically under 20′ and how the r-pod was #1 on the list in sales. This covers a few of what I encountered in Louisville. I’ll be writing up an additional post hopefully later this coming week on some additional insights on what I saw from T@B, Winnebago, and a couple of others. But due to a load of overtime I’m facing at my day job this week, I wanted to get a partial post out there for you all . More to come! 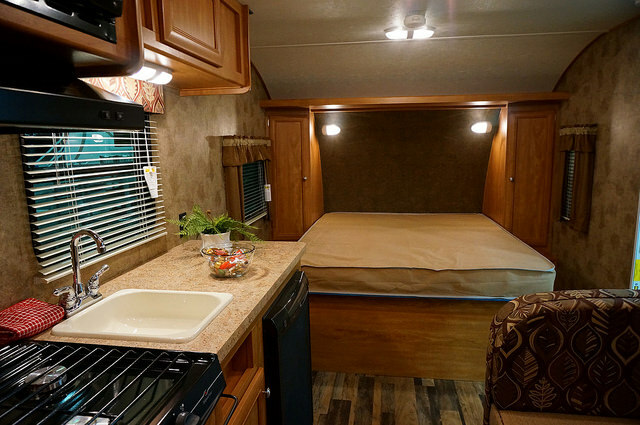 Let me start off by saying I’m grateful for the RV industry. 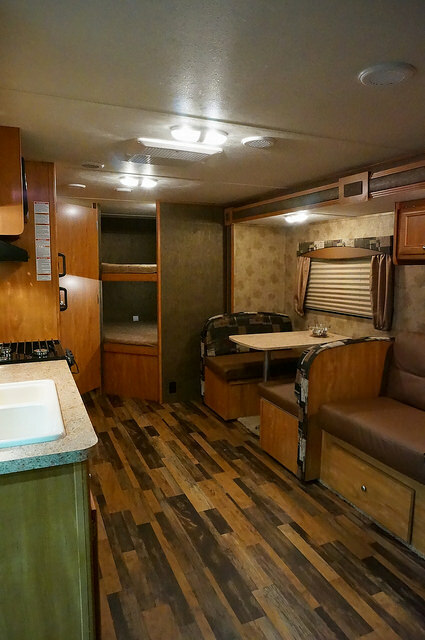 After all, if it weren’t for RVs, most of us would not be able to experience the happiness that camping brings. 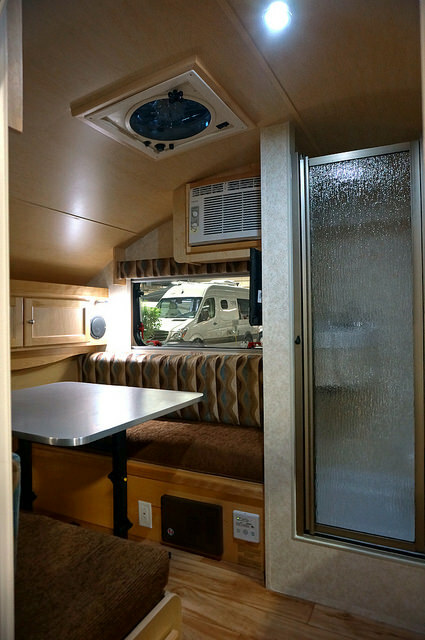 I’m also grateful that the RV industry is there for me to have things to write about on this blog. It’s a way for me to channel a love I have for writing on topics I enjoy writing about. And that in turn fuels a competitive spirit I have when I look at my stats every day to see how many people click on a page on this web site you’re reading. It always gives me a little boost when the site has a good day of hits. And, the $$ I get from a certain search engine whose ads appear on this site makes me quite grateful to those readers that take the time to click on them. 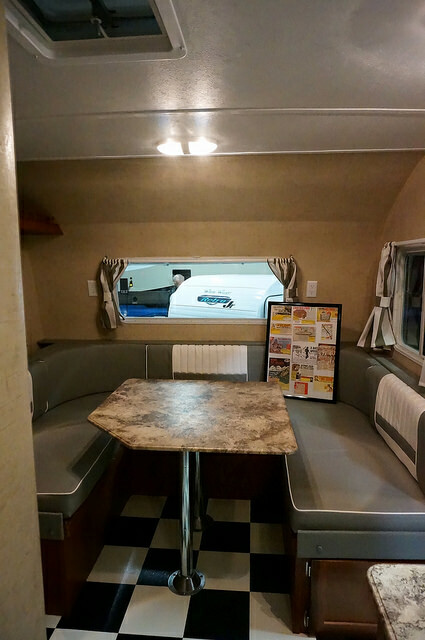 So our dinette is 30″ wide? That’s just about perfect for two normal sized adults, or an adult on one side and two toddlers on the other side. Anytime I see a layout like this, it’s like nails on a chalkboard for me. 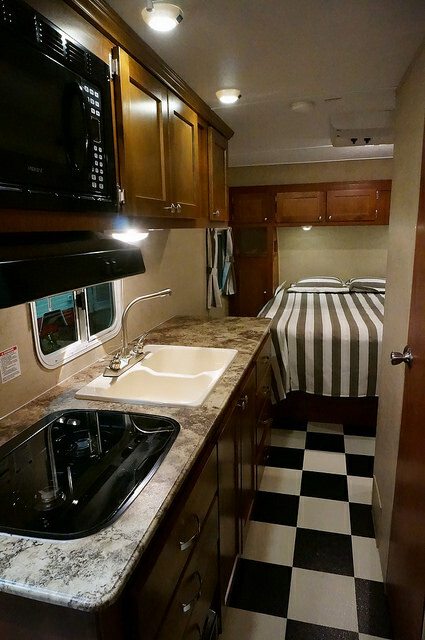 It makes me wonder if RV floorplan designers are bad at math, have never camped. or likely both. However, I know the counter argument will be “Well, most people eat outside anyway”. If that’s the argument, then don’t bother with a dinette at all. I’m sure that’ll go over with the buying public just as well. 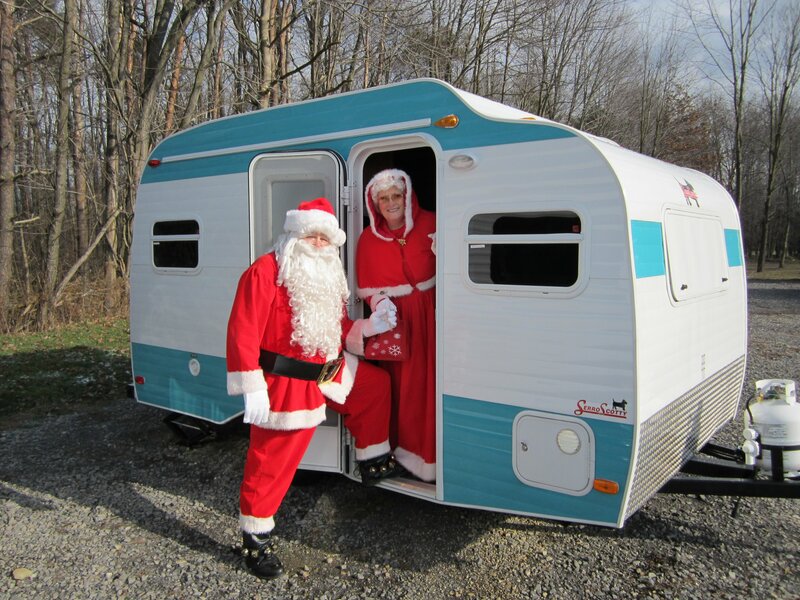 And from all of us here at The Small Trailer Enthusiast….and my grandson Jameson…..Merry Christmas and have a GREAT holiday season!